By studying data from the Kepler probe, scientists have found a planet about the size of Mars, about 200 light-years away from Earth. 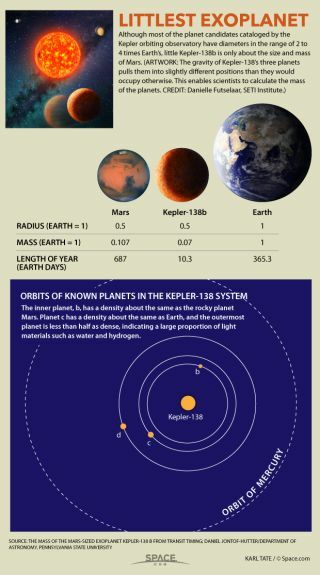 Although most of the planet candidates cataloged by NASA's Kepler space telescope have diameters in the range of 2 to 4 times that of the Earth, little Kepler-138 b is only about the size and mass of Mars. Kepler-138 b is one of three planets orbiting the red dwarf star Kepler-138, which is located 200 light-years from Earth in the constellation Lyra. The gravity of Kepler-138's three planets pulls them into slightly different positions than they would occupy otherwise. This enables scientists to calculate the mass of the planets.